When it comes to marketing drinks, bottle glorifiers rank high as one of the best promotional tools. The competition in the alcoholic beverage industry is extremely hectic. So one way to gain a competitive advantage is to have a custom glorifier design that represents what your company stands for and what you aim to deliver. Prince Polignac has this incredible idea of an effective marketing item. In their latest marketing project, the brand updated its current packaging style with a better and classier set. As you can see in the photo, the packaging looks like a well-crafted origami that opens up like a peacock showing off its patterned plumage. In other words, this packaging is absolutely stunning! Another noticeable thing in this set is that the packaging doubles as a bottle glorifier. 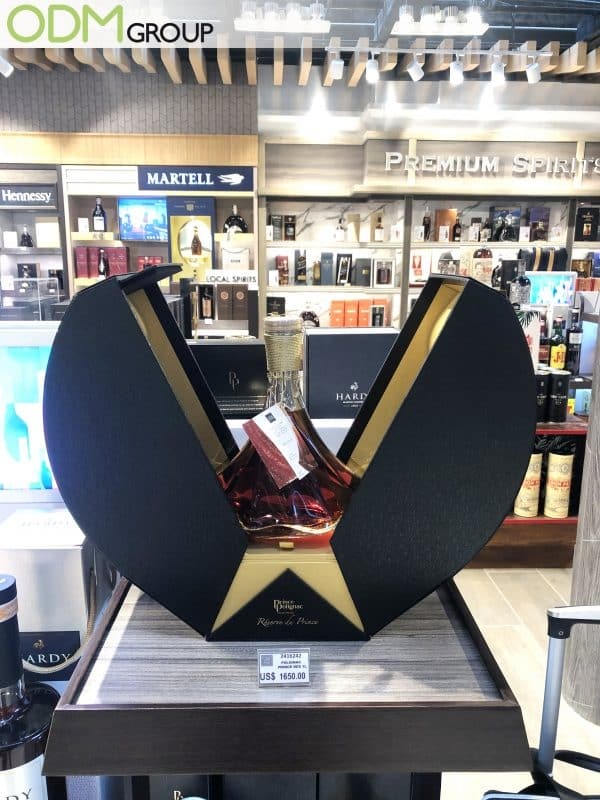 A bottle glorifier is a display that is designed to fit on a bottle, typically with a cut-out area to hold the bottle in a position that ensures maximum marketing exposure to the product. If you’re still wondering how bottle glorifiers help the overall marketing campaign of your brand, check out these few amazing case studies from various brands. Here is how Glenlivet incorporates all Olympic-related aspects into a branded bottle glorifier. It’s a pretty clever move which says a lot about the brand. Another great example of a catchy display is this trendy LED bottle glorifier. This promotional item highlights the products so it stands out in clubs, pubs, events, etc. Its unique LED usage makes it very appealing which benefits your brand in a colourful way. Why Do We Love This Bottle Glorifier Design From Prince Polignac? Creative and Functional – We love how the brand creates 2-in-1 drinks POS display and packaging. This helps a lot in branding because this fascinates customers and this could potentially influence them to purchase the product. Strong Branding Message – Because of its dual purpose, these promo items send a strong branding message to customers. First, they see this interesting pos bottle glorifier that catches their attention. Then, the quality of the packaging helps them establish their brand as something that values quality and great service. 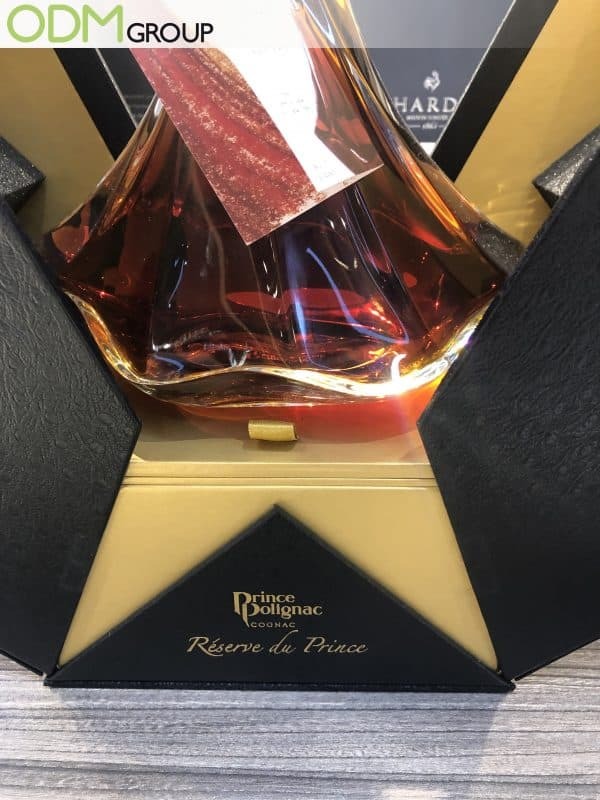 Bottle Glorifier Design Serves As A Good Cognac PackagingIn conclusion, we can say that this is one of the best bottle glorifier designs we have seen thus far because of it combines aesthetics and funcitonality. It is great for brands that are conscious of their marketing budget because you get a 2 in 1 type of promotion. If you would like to create your own marketing merchandise, POS display units for drinks, custom retail packaging, as well as bespoke in-store displays, feel free to contact The ODM Group. Our team is always ready to help you source, design, and manufacture promotional items for your business. A Bottle Glorifier helps promote your brand which is vital for your sales to take off. So, if you’re looking for anotler bottle glorifier design, check out the few suggestion below. Learn these sure-fire tricks for an awesome wooden brand packaging. Follow these essential step to have a successful marketing campaign. A huge promotional bottle cradle is great as it is very visible to customers. When a customer walks around the drinks section, the first thing that would catch their eye would be the bottle cradle. Custom packaging adds value to your products and improves your image. More durable packaging makes your brand look reliable and high quality. A well-designed packaging is important in raising awareness about your brand. This is because people are drawn to beautiful things and a well-designed brand packaging design is more likely to capture their interest.